"Masterpieces in the Making." That was the original tagline for Ridgewood Cluster in North Reston, and the claim is fitting. Designer/developer Van Metre won many awards for overall community excellence, interior design, and energy conservation initiatives. Built in 1989, Ridgewood Cluster proudly carries on the tradition of excellence with a neighborhood that elegantly blends with the natural environment. These richly appointed, 3-level townhomes have lofts and cathedral ceilings to add space and visual appeal. Each home has a brick and cedar siding exterior, and many have a garage. There are five models of townhomes throughout the cluster--some offer luxurious master suites, others offer fabulous areas for entertaining. There is a home here for whatever your style of living is! 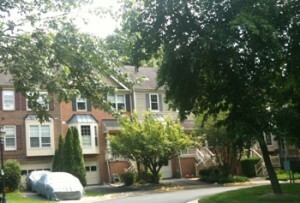 Ridgewood Cluster is located on Great Owl Drive, right off Reston Parkway between Baron Cameron and Route 7. This cluster is close to North Point Village shopping, and just a quick trip down Reston Parkway to Reston Town Center and Lake Anne Plaza.